Ready for another sketch? I was looking through some older cards and came across this layout. I remember being quite obsessed with it for a while, so I thought I'd bring it back. Although it has a minimum of four layers, I consider it a good example of clean and simple. 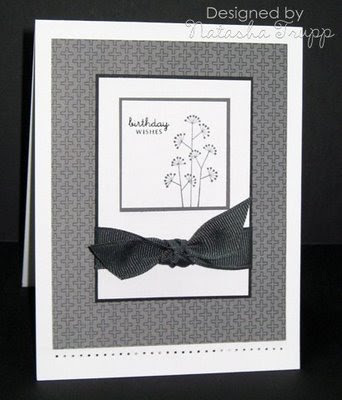 I like to feature a patterned paper as the large piece on the card base. Then I usually do another layer of the same colour as the card base, and finally a small square with my sentiment and image. I also usually place ribbon underneath the square. However, you could also place your sentiment there. Patterned Paper layer: 3.75x4.75. Place this layer so that there is more space left on the bottom. That way there is room for a row of dots. Next layer (includes mat): 2.5x3.5. What a perfectly gorgeous card! Great layout -- I will be sure to use it soon! Natasha! I love the sketch! Hmmm, feel the need to go to my stamp room tonight. I just love pocket silhouettes and your use of it here is so perfect! I love your blog, I am a subscriber and check it often for inspiration. I really appreciate this sketch as you have made the leg work much easier this time for me by including the dimensions for the layers. Thanks so much, please keep the dimensions coming and the FTL. Yep!!! I am ready for another sketch! Thanks for the inspiration! I'll be sure to use it soon! Love your card! I've just recently discovered your website, and I love it! I'm back almost every day to see what you've got. And your inspiration has already helped me with a few cards! Followed you here from SCS, this is great! I love your sketches and inspiration! Yay!! I will try to jump in! Great sketch. I just found your site... I will try and play along later this weekend. Thank you for posting the dimensions; that sure made it sooooo much easier for me than having to figure them out myself through"trial and error!" I've already made three cards using this sketch! Love this layout. I read your blog everyday. I got imspired by Joan's(Paperlicious) last evening and came back to check out the measurements. Thanks for posting them. My paper is cut. Will finish a card this morning. I'll be using this sketch alot. Great sketch!!! I tried it out last night and really like it! 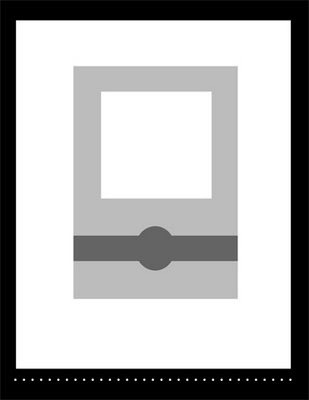 Love the challenge and the design team members cards this week. Thanks your challenge and for taking a look at my creation! Awesome sketch and card, Natasha!